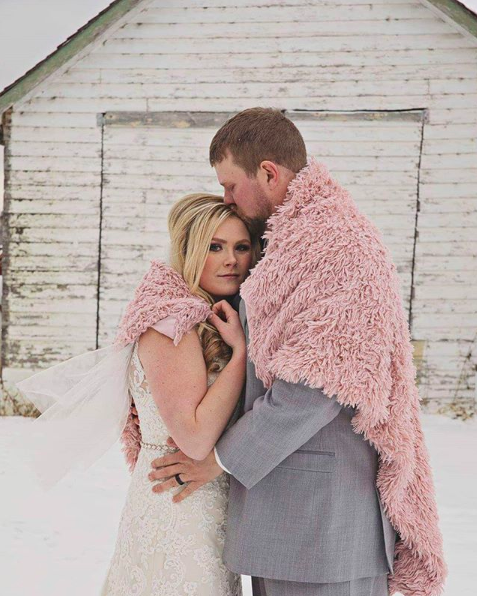 Now that the cold weather is finally setting in, we can start thinking clearly about what to include in a winter wedding. Yes, you heard that right! 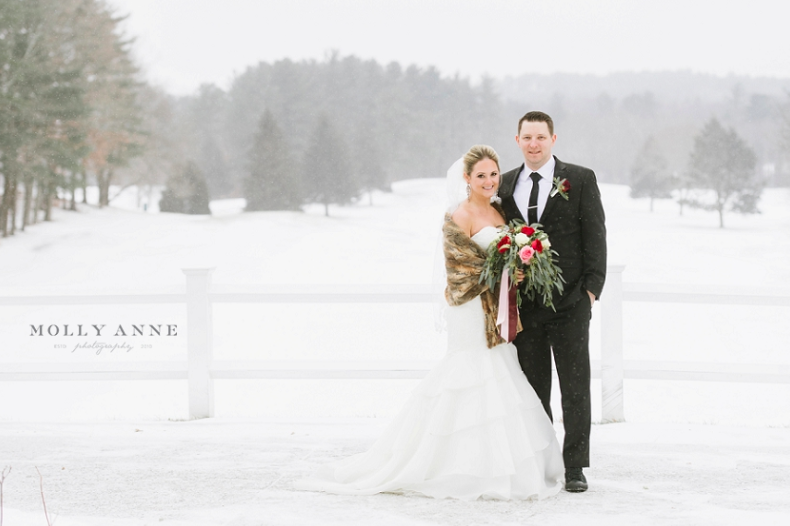 Winter weddings are on the rise, becoming more popular than ever before. Although the grass is greener and the weather is warmer in the summer, your guests might just appreciate a good chance to snuggle up to each other with the colors of your wedding really standing out against the somber nature colors. 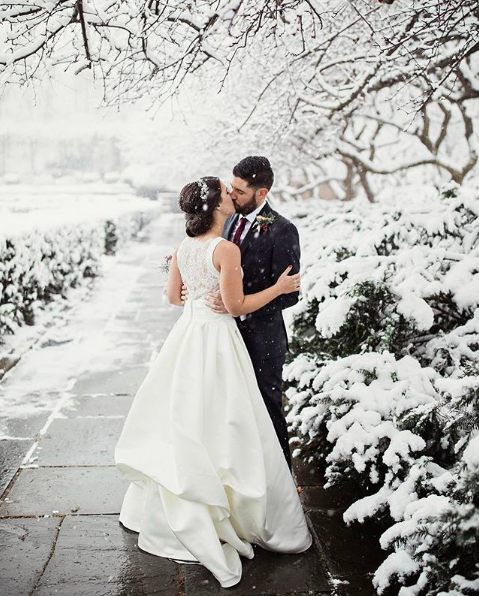 Of course there’s also the chance of snow to make your wedding a winter wonderland! With December right around the corner we are going to tell your how to prepare yourself and your guests for a chilly wedding day. You can’t have a winter wedding without including candles. You can have them running along the walkway to the entrance of your wedding or even guiding you down the aisle. Candles can be included in lanterns as the centerpiece of each table to really brighten up your wedding. Candles have a way of creating a calming and cozy environment while making everyone a little bit warmer on the outside and the inside. 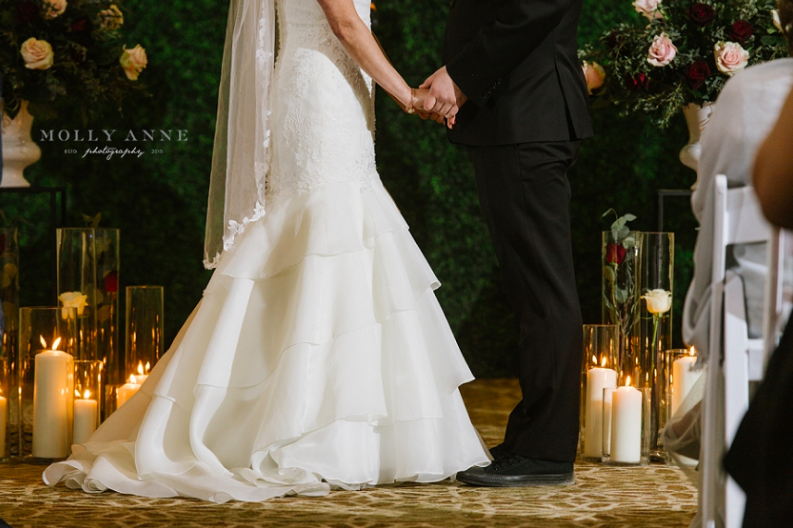 Don’t have your winter wedding without taking advantage of candles! Your guests will be happy to see blankets to lay over their laps after walking into the venue before your ceremony. Make sure to keep blankets just inside the entrance so they stay warm and so your guests can see them right as they arrive. Make sure your blankets match the theme of your wedding and be happy knowing that you’re keeping your guests warm! This could create a better atmosphere for everyone, especially the men who no longer have to forfeit their coats to the ladies! 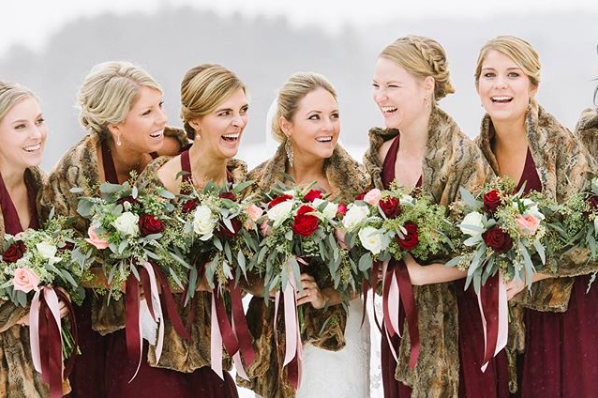 Be sure to incorporate winter colors into your winter wedding. White and silver are a great option to go with, especially paired with each other. However, you could also go with deeper colors, such as maroon or dark green, and pair those with a lighter rose pink or forest green. There are tons of color options that could work for your winter wedding but bright, summer color combos are not how we would advise you to make your guests feel warm and happy. Keep the colors at a more neutral or cool level and you’ll be good to go! 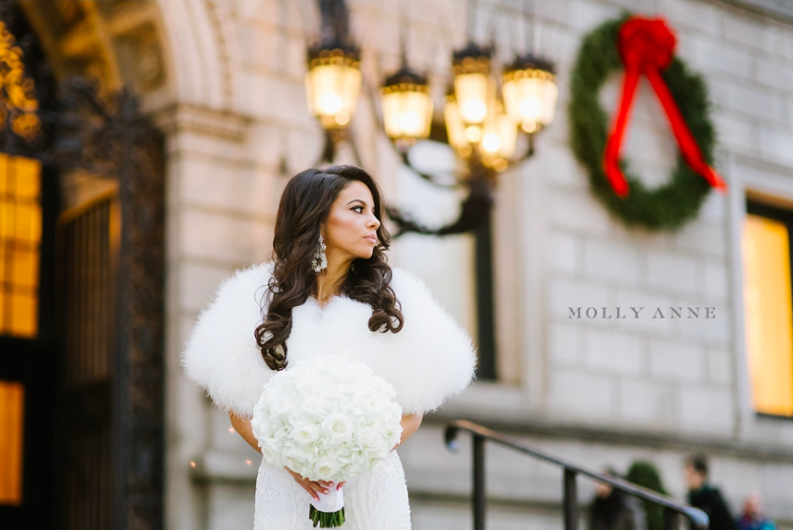 In the winter the bride can accessorize more than ever! Suit yourself up with a beautiful shawl and some dainty white gloves to keep you beautiful and warm on your wedding day. You can also dress up your bridesmaids with their own shawls or scarves to keep them warm as well. Accessorizing a winter wedding can bring a certain level of sophistication that you may not have even thought about. We think winter jewelry can also be bigger and better as well. 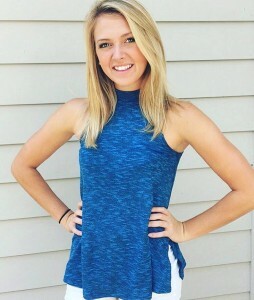 Just go ahead and make yourself look like an ice queen! Photo from Sweetwood Creative Co. This is another must-have, can’t-go-without, essential for your winter wedding. During the reception your guests are going to want to warm up fast and the first thing they’re going to want is a hot beverage! 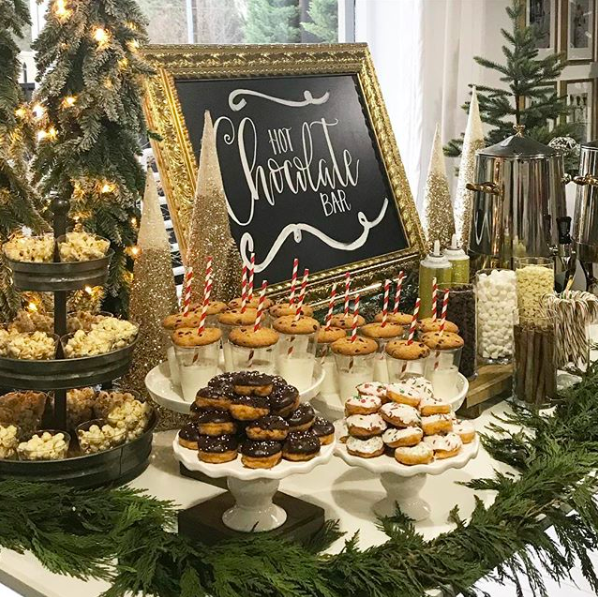 Setting up a hot chocolate bar or a coffee station for your big day is a perfect idea, and there’s no doubt that all your guests will be happy about it. Your choice of alcohol could even be a spiked hot chocolate, but make sure to add that in at the bar so those under 21 can also enjoy some delicious hot chocolate! Whether real or fake, the addition of snow will be sure to send your wedding over the top. Sprinkle some fake snow down the aisle and even between the seats so it surrounds your guests. You could even have your flower girl throw out little handfuls of fake snow instead of flowers as she walks down the aisle before you. Incorporate snow into your exit as well by having your guests throw snow all around you as you wave goodbye. You would officially be the coolest bride around!